This quarter we are taking a look at the parathyroid gland. Most of us have four of these glands, but around 10% of the population actually have more. These glands can be found in our throats, sitting on the posterior side (the back) of our thyroid gland on both the upper and lower regions of its right and left side (as shown in the picture below). There is quite a complex embryologic development that arrives at the placing of the glands, so their final location on the thyroid can be quite variable between individuals. Approximate locations for our four parathyroid glands. [Click image for source]. The thyroid gland secretes hormones, principally thyroxine (T4) and triiodothyronine (T3), which regulate growth and development, metabolism, heart rate and body temperature. A third hormone it produces, calcitonin, functions in calcium homeostasis. The parathyroid glands produce parathyroid hormone (PTH), which regulates our body’s levels of calcium and phosphorous by increasing and decreasing them, respectively. The calcitonin produced by the thyroid reduces the blood calcium levels, thus counteracting the effects of PTH. More often than not, parathyroid glands are removed because the glands are producing too much PTH, a condition known as hyperparathyroidism. Over secretion of PTH is most commonly due to a parathyroid adenoma (a benign tumour). Other causes include parathyroid hyperplasia or, very rarely, a parathyroid carcinoma. Too much PTH increases the calcium levels in the blood above the normal range. This hypercalcaemia (to call it by its proper name), can have an impact on several body systems, but most significant is the effect it has on our bones and kidneys, and this is because PTH acts on these to raise calcium levels in our serum. Hyperparathyroidism often comes hand in hand with osteoporosis, which is a condition that weakens the bones so much that they become prone to breaking. In the instances where osteoporosis is caused by hyperparathyroidism, the only treatment is to have the glands surgically removed. The size of a healthy parathyroid gland averages about the size of a pea and weighs around 30mg (0.03 grams), although this does vary through life. 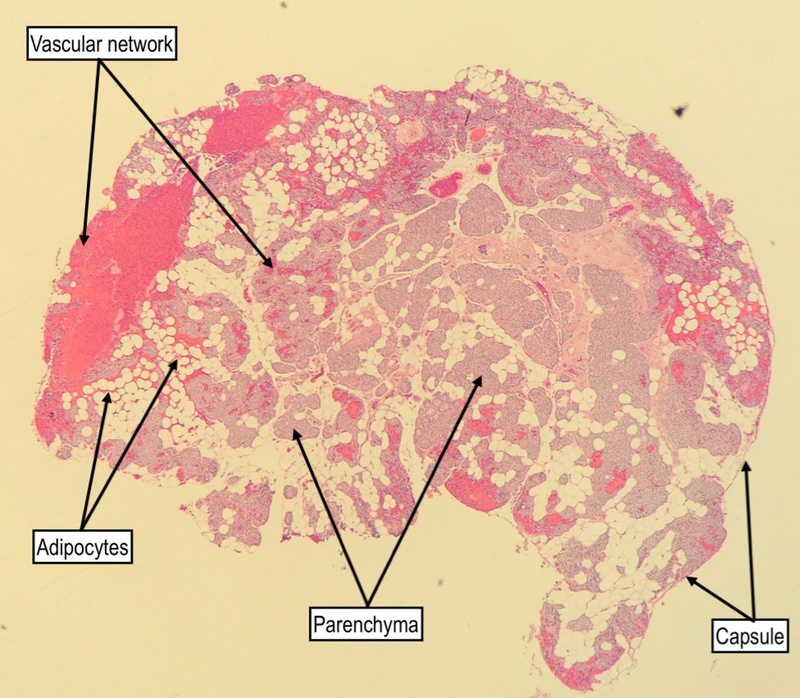 Histologically, the parathyroid gland is a small package of parenchyma, dotted with adipocytes (fat cells) and entwined with a complex vascular network (see photomicrograph below). Generally, the younger we are, the more parenchyma we have in comparison to fat. As we progress into our 40s, the ratio of parenchyma to fat cells stabilises at around 50:50. The entire parathyroid gland is encased by a thin fibrous connective tissue capsule (see below). 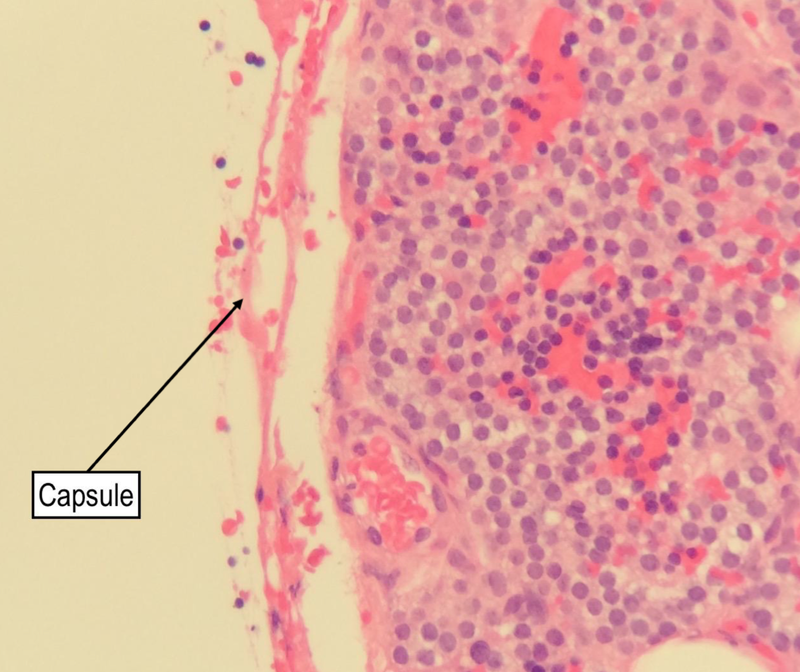 This capsule also separates the parathyroid gland from the thyroid gland. On a higher power, you can often see that the parenchymal cells arrange themselves in either a follicular or a cord-like pattern (see below). 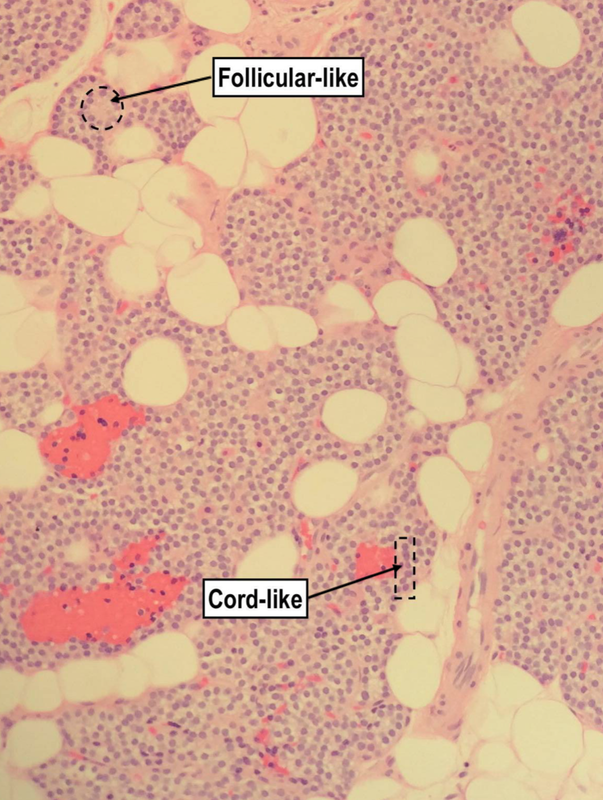 A medium power H&E showing the follicular-like and cord-like cell arrangements. Taking a closer look at the parenchyma, we see that it is made up of two main cell types; these are called “chief cells” and “oxyphilic cells” (see below). Chief cells are the most abundant. Their nuclei are rounded and contain a lot of nuclear chromatin, so appear very dense. Their cytoplasm contain granules and can either appear clear or slightly eosinophilic (pink) with intracellular lipid. Chief cells are the cells of the parathyroid gland that produce PTH, which is stored in the cytoplasmic secretory granules. They also have a calcium ion sensing receptor on their cell membrane that become stimulated in low serum levels of calcium. Once the receptors are activated, this cascades a message to the cell to start producing and secrete PTH. If the cell in “hormonally active”, the previously mentioned intracellular lipid is usually absent. Oxyphilic cells are usually only found in adults, appearing at the onset of puberty. They exist in fewer numbers and are mostly just dotted among the chief cells. As we age, however, these cells often increase in number and begin to form small nodular clusters (see below). 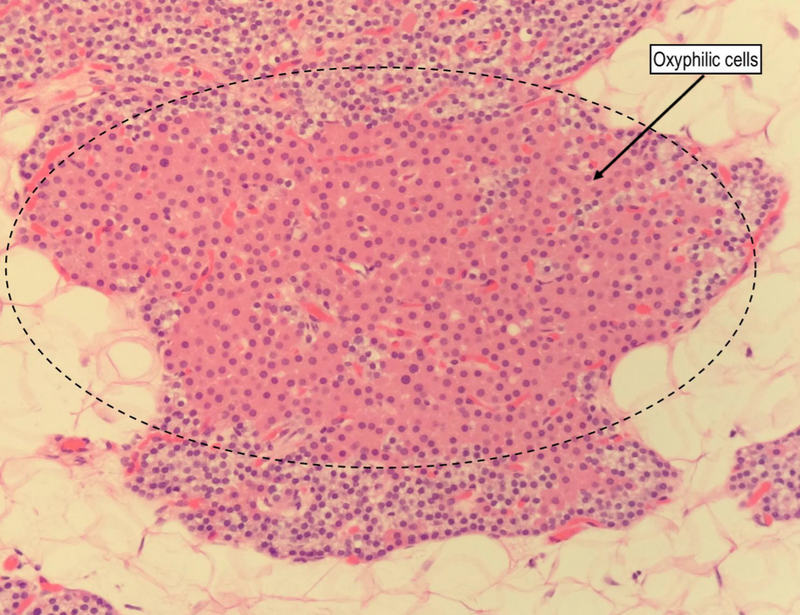 A low power H&E showing the nodular arrangement of oxyphilic cells that can occur. 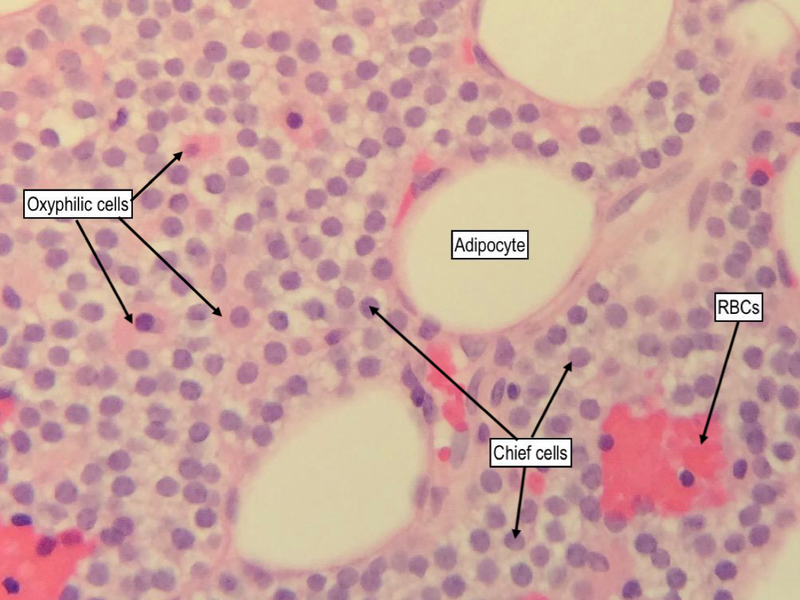 Oxyphilic cells are larger and much more eosinophilic than the chief cells and, due to the high number of mitochondria within them, have a very grainy looking cytoplasm. Very little is known about the function of these cells but one theory is that they may represent transitional chief cells.